On 17th April 2001 we made the decision to bring a buddy into our lives. We went to Marienheem and visited Ceasars lovely breeder Mrs J Meijer. She had a litter of 11 puppies, 3 males and 8 females that had been born on 27th March. We noticed Ceasar straight away and picked him for his lovely, soft character, which were our only requirements - it was love at first sight. Ceasar was a very well behaved puppy that had stolen our hearts forever. We had already decided on the Rhodesian Ridgeback because of its outstanding qualities and performance. After receiving many compliments about Ceasar we were encouraged to visit the offspring day in 2002. We were advised by Mr J Coppens to train and go to dog shows with Ceasar, so we went away and bought ourselves some books on showing. A few sessions of ringcraft training later when Ceasar was 18 months old, we entered our first dog show in our hometown of Rotterdam. Ceasar did a remarkable job and achieved 2nd excellent and Res CAC. 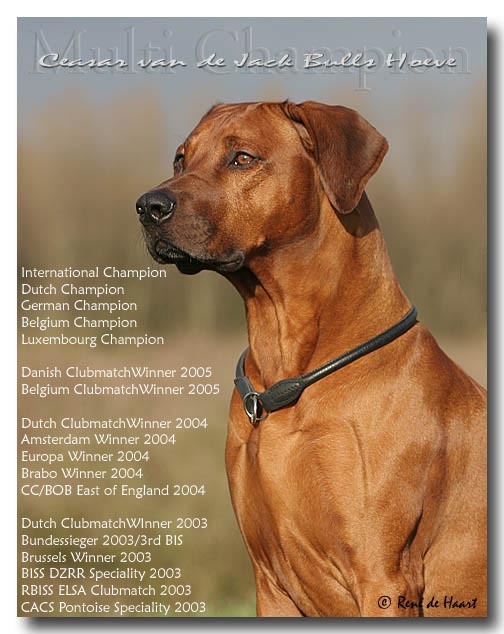 Although we never had the intention to show Ceasar, he gained the titles of DUTCH, INTERNATIONAL & LUXEMBOURG CHAMPION, RRCN Clubmatch Winner '03 & '04, Bundessieger '03, Brussels Winner '03, EuropaSieger '04 & BraboWinner '04. In addition to the excellent show results gained, Ceasar is a great friend to have with a lovely character and a natural beauty. His favourite things to do is jump in the sand dunes and run like crazy on the beach. Ceasar also loves to run along side us on our mountain bikes to use up most of his energy. At the moment Ceasar is a grown up Rhodesian Ridgeback, well developed in every way. He has brought a great new experience to our lives. We hope our homepage gives you a good impression of our Ceasar. VDH-RCAC Bundessieger 2004...a nice birthdaypresentOn 27th March 2004, Ceasar reached the age of 3 years and received after winning the Exposition Canine Internationale in Champion Classon the title Luxembourg Champion. A surprising day...On the 20th september 2003 we went to the RRCN Clubmatch (total 128 RR's), Ceasar became 1st Excellent, CAC/BISS. With this great result Ceasar won the title RRCN Clubmatchwinner 2003. On the 8th of May 2004 we went to Germany for the Europa Sieger Zuchtschau (total 95 RR's) in Dortmund, Ceasar loved it and became 1st Excellent VDH-CAC/DZRR-CAC/CACIB/BOB and 2nd BOG!! With this fantastic result Ceasar won the title Europa Sieger 2004 (European Winner 2004)On the 17th October 2003 we went to Germany for the Bundessieger Zuchtschau (total 68 RR's) in Dortmund, Ceasar did a remarkable job this weekend and became 1st Excellent VDH-CAC/DZRR-CAC/CACIB/BOB and 1st BOG/3rd BIS!! With this fantastic result Ceasar won the title Bundessieger 2003 and became 3rd BEST IN SHOW of 5000 dogs!Ceasar also entered the Spezial Zuchtschau DZZR (total 50 RR's) on the 18th October 2003 in Dortmund. Ceasar did it again and became 1st Excellent VDH-CAC/DZRR-CAC/BISS!! On the 18th of April we went to the Brabowinner 2004 in Antwerp, Belgium. Ceasar had a marvelous day 1st Excellent CAC/CACIB/BOB 2BOG, with this result Ceasar won the title BRABO Winner 2004. On the 24th August 2003 we went to the E.L.S.A. Clubmatch (total 58 RR's) in Germany, Ceasar became 1st Excellent, VDH-CAC/ELSA-CAC/RBISS.